The main pool is 6 lanes, 25 yards long. 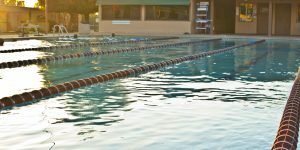 (18 lengths = ¼ mile, 36 lengths = ½ mile) It is heated year round and maintained at 82°. The 4 lane pool on the north side of the racquetball building is designated for adult lap swim only. (You must be 18 yrs. or older). Children are permitted in the outdoor jacuzzi. Discretion is advised for toddlers under 2 years old, pregnant mothers, and persons with high blood pressure. 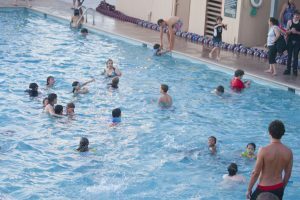 Read more about swimming lessons. We have a covered wading pool for little swimmers. Here, your child or toddler can enjoy the water under your supervision in a shallow pool. The lifeguards cannot be responsible. Please view the pool rules for more info.